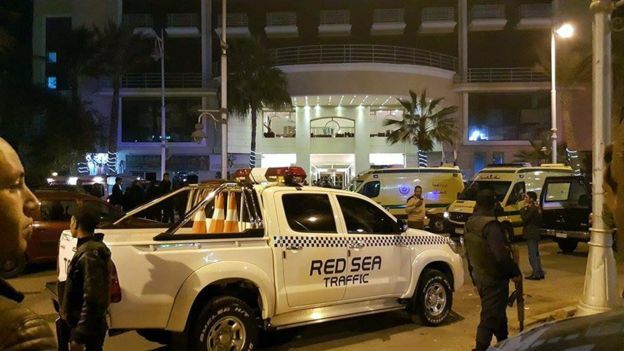 A hotel in Egypt’s Red Sea resort town of Hurghada was attacked by at least two men, injuring at least three two Austrians and one Swede. Egypt’s police stressed that no guns or explosives were found on the attackers. The attackers were found to be carrying a ‘sound pistol’ and knives, said the official statement. This appears to corroborate earlier claims that two tourists were injured, suffering from stab wounds. Earlier, Reuters reported that gunmen arrived from the sea to carry out the attack at Bella Vista Hotel near the downtown area of Hurghada. Egypt’s police have not clarified whether the assailants entered from the sea or not. The motives of the attackers in the latest attack appears unclear, with some claiming that the men had aimed to kidnap tourists while others stating that the men had been attempting a robbery.